It only seems like a natural progression to bake homemade chocolate chip graham crackers one day and homemade fluffy marshmallows the next. There is just nothing better than a toasted marshmallow smooshed between two graham crackers, and I have found out this week that homemade marshmallows are about 200 million times better than the storebought version. When I told my son we were going to make marshmallows, he thought that was the coolest thing ever, but he couldn’t quite wrap his mind around it. First, he didn’t know it was possible to even make a marshmallow. Secondly, his method was way off. He was convinced that you just take a bunch of mini marshmallows, melt them down, and throw them in a pan. Nice try, little one, nice try. Yes, there are a few more steps to making homemade marshmallows than my 6 year old would like, but I just want you to know how worth it they are. They just taste so fresh. Not something created in a factory. Real sugar. Real fluffy texture. Super soft. Super perfect in your summer s’more. Speaking of super soft marshmallows, I have an important question to ask all you lovely people. Do you like your marshmallows soft or a little stale-like? I, personally, love my marshmallows fresh. Right out of the pan, and then you’ve got to keep them wrapped up so they stay pillow-soft. Now, for my wife… she’ll specifically take a handful of marshmallows and set them in a bowl on the counter so they can dry out a bit. My opinion… gross. 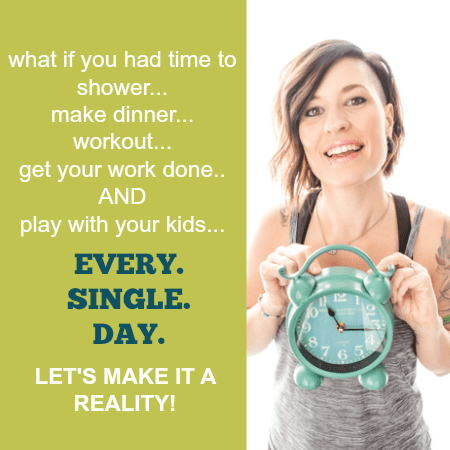 Do you know anyone who does this? A little weird, right? 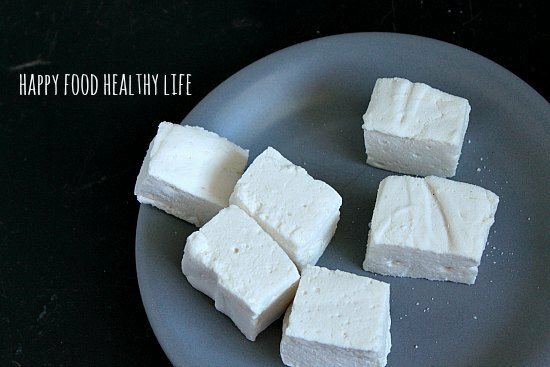 Luckily, there is no staleness going on with these perfect homemade fluffy marshmallows. They will be perfect in your s’mores, hot chocolate, or well.. just right in your mouth! In bowl of a standing electric mixer or in a large bowl sprinkle gelatin over 1/2 cup cold cold water, and let soften. With a stand- or a hand-held electric mixer beat mixture on high speed until white, thick, and nearly tripled in volume. In separate medium bowl with cleaned beaters beat egg whites until they just hold stiff peaks. Beat whites and vanilla into sugar mixture until just combined. Pour mixture into baking pan and don’t fret if you don’t get it all out. Sift 1/4 cup confectioners sugar evenly over top. Chill marshmallow, uncovered, until firm, at least three hours, and up to one day. Run a thin knife around edges of pan and turn pan over onto a large cutting board. Lifting up one corner of inverted pan, with fingers loosen marshmallow and ease onto cutting board. 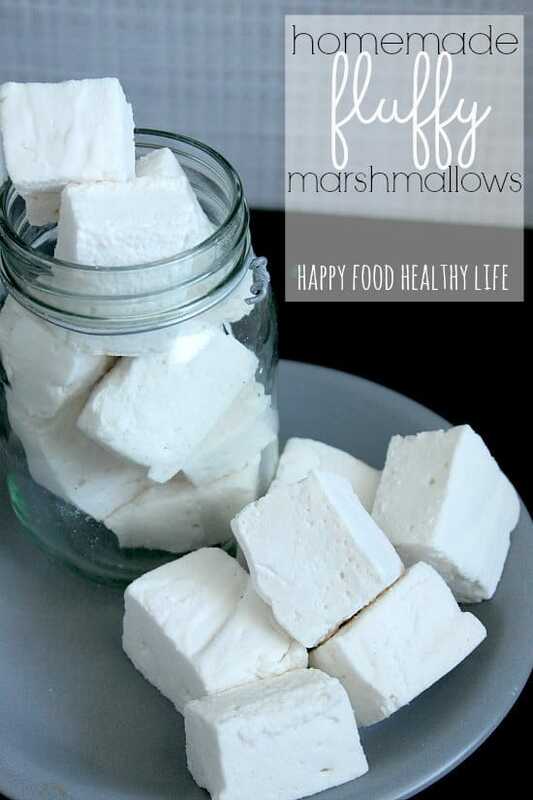 With a large knife trim edges of marshmallow and cut marshmallow into roughly one-inch cubes. Sift remaining confectioners’ sugar back into your now-empty baking pan, and roll the marshmallows through it, on all six sides, before shaking off the excess and packing them away or using right away. I made these yesterday and they turned out perfectly! Very fluffy and sweet. They were fun to make as well. Thanks for sharing the recipe. I’m so happy that you tried these out and loved them! Aren’t they so much better than store-bought?! theses look yummy and sound easy enough. i had some fresh marshmallows on a carnival cruise recently and they were delicious, theirs were strawberry flavored and pink. mmmm so yummy i think i may give these a try. They’re so easy and nothing quite compares to homemade! I love homemade marshmallows. Hello from The Party Bunch. they are so much better than store-bought! I’ve always wanted to try and make my own marshmallows… thanks for sharing at our Best of the Weekend party – pinned!